South Korean Overwatch pro Miro is probably the best Winston player in the world. His deft tank work helped South Korea win the first Overwatch World Cup and he took home personal tournament MVP honors as well. If you want a highlight reel of his best moments, well here you go. Miro’s Lunatic-Hai squad was playing Misfits earlier this afternoon, and he showed off his gorilla skills with an exquisitely timed Jump Pack recovery. 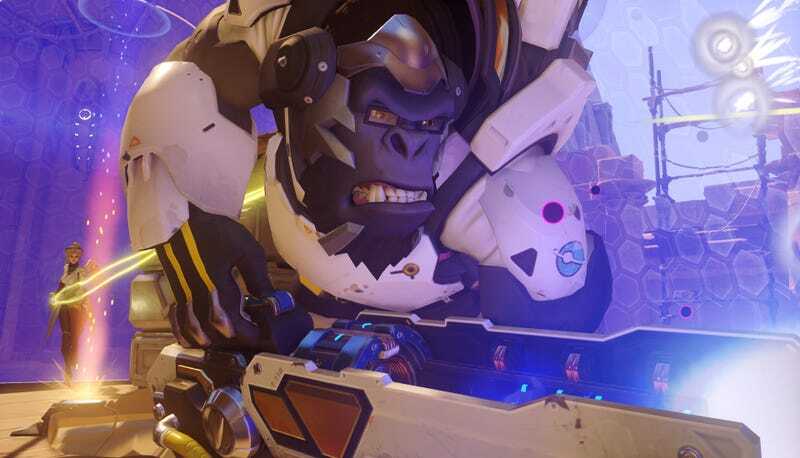 When Winston pops his ultimate, Primal Rage, he gets a big health boost and the damage of his melee attacks increases. Because you can’t activate his tesla cannon while he’s ulting, players’ ability to maneuver around the map is key to success. As a master gorillaman, Miro knows the precise limits of his ultimate, and he leapt over the edge of the map to and punch out the opponents’ Mercy while taking heavy fire from Pharah. He looked dead as hell, but made perfect use of the diminished cooldown time on his Jump Pack and got back up to safety. The move came just after 2:18:42 in this stream. The announcers wrote him off, but if anyone was going to pull off this sort of last-ditch mid-air save, it’d be Miro.